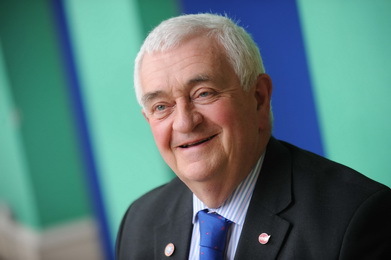 LATEST NEWS: Eco Cities and Green Building Workshop to be hosted by Alan Kell, co-Chair of the UK – China Eco Cities Group from 14.00 to 16.30. 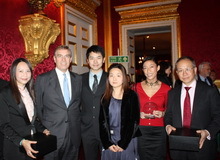 This group was recently awarded £300,000 FCO Prosperity Funding, Feb 8 will be an update meeting for the Group members (ranging from multinationals to SMEs) about their latest work programme and activities in the UK and China. See www.ukchinagroup.org for more info. A limited number of places at this workshop for non-group members are available. The COP 17 UN Climate Change talks often have a dramatic conclusion and Durban last month was no exception where talks once again were brought back from the brink of collapse. Newspapers ran headlines of “Climate deal after politicians get ten minutes to save the world” which sums up the frenzied negotiations, resulting in acceptance for the first time by the world’s most polluting countries that they should be bound by international law to cut emissions. Lord Prescott has been a key player at every round of these talks, starting with Kyoto where he worked closely with US Vice President Al Gore to secure an agreement. On February 8th Lord Prescott will share his unique insight into the implications of climate change from a global perspective, and in particular from the Chinese perspective. 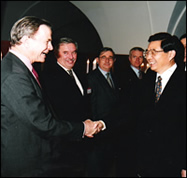 Lord Prescott has visited China every year over the last 14 consecutive years, more times than any other politician and has a unique relationship with numerous Chinese leaders, making him one of the most qualified people on the planet to speak on this fascinating subject. Not to be missed! A panel discussion will follow, panelists include Prof Alan Barrell, Entrepreneur in Residence, Centre for Entrepreneurial learning, Judge Business School, University of Cambridge, Hugh Davies CMG, Chairman of the China Association and Dr Aled Jones FRSA, the inaugural Director of the Global Sustainability Institute (GSI) at Anglia Ruskin University. The GSI’s research is focused around personal motivations and systems change set against the challenges of sustainability. Dr Jones also chairs a working group on climate finance within the Capital Markets Climate Initiative on behalf of Greg Barker, the Minister for Climate Change in the UK Department for Energy and Climate Change (DECC). Dr Jones was previously the Deputy Director at the University of Cambridge Programme for Sustainability Leadership and was Director of the Climate Leadership Programme and Chevening Economics of Climate Change Programme (for the UK Foreign and Commonwealth Office). He was a founding member of the ClimateWise insurance principles, was facilitator for the P8 Pensions Group, 12 of the world's largest public pension funds working collaboratively to address the problem of climate change and investments and set up the Banking & Environment Initiative. 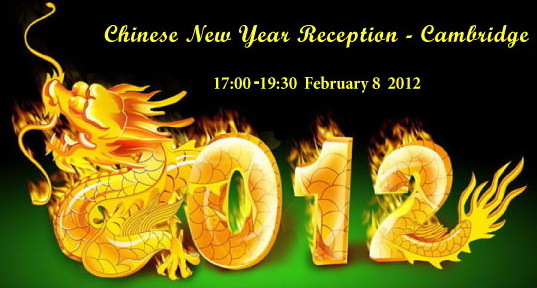 The Cambridge University Lion Dance Troupe will perform immediately after the lecture and a drinks reception follows. The cost of attending is £24 + vat however we have a limited number of free places if you are a student or unemployed. Please state clearly if you are applying for a free place. Please also state clearly if you are applying for a place at the Eco Cities Workshop prior to the Lecture and Reception. The eco cities seminar is in room LAB 207 on the 2nd floor and starts at 14.00, the New Year Lecture is in Lecture Theatre LAB 002 on the ground floor, arrival from 17.00 starting promptly at 17.30. Late arrivals will be asked to wait for a convenient break in the proceedings, so please arrive early and allow plenty of time to get across the campus. The main reception is on East Rd, it’s a large campus so it’s easier to use the Broad St entrance which allows easy access to LAB 002 and LAB 207. Please click here for a map or use postcode CB1 1PT on google maps. Traffic in Cambridge can be challenging at this time of day, if you are arriving by train it can be quicker to walk from the station than to get a taxi! Note that we are unable to offer car parking on site, the nearest public car park is at the Grafton Centre, please then make your way to the Reception Desk in the Helmore Building on East Road. Or it’s an easy walk or short taxi journey from Cambridge train station. 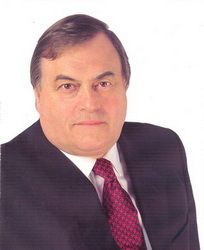 Following the Labour Party's election in May 1997 John Prescott was appointed Deputy Prime Minister and First Secretary of State for Environment, Transport andthe Regions. 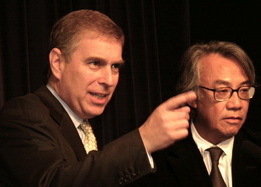 In May 2006 Prime Minister Tony Blair asked Mr Prescott to chair a number of major Cabinet Committees and to oversee the efficient development of Government Policy. He also asked him to continue with his international work particularly with regard to China and, in recognition of his work in delivering the Kyoto Treaty, to work with the Foreign Secretary and the Secretary of State for the Environment on developing the post Kyoto agenda. 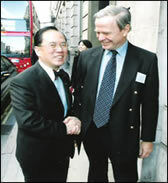 In addition to his responsibilities as Deputy Prime Minister, Mr Prescott was asked to co-chair The UK-China Task Force, together with State Councillor Tang. 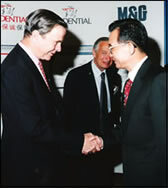 The Task Force was created in November 2003 by Premier Wen and Prime Minister Tony Blair to deepen relations, foster mutual understanding and further cooperation between China and the United Kingdom. Mr Prescott stepped down in 2007, having held that position for over 10 years, and is Britain's longest serving Deputy Prime Minister. He has continued to take an active interest in China, including his involvement in a memorandum signed between his home region of Yorkshire in the UK and the region of Chongqing in China to improve investment, commercial contact, science, environment and educational links. 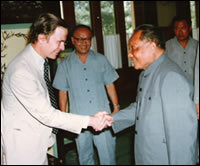 He is also the only senior politician to visit China every year for fourteen consecutive years. 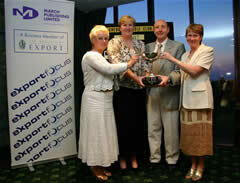 In 2010 Mr Prescott was made a Lord of the Realm by Her Majesty The Queen and gained the official title of Lord Prescott. He currently sits in the House of Lords, the Upper House of UK Parliament. 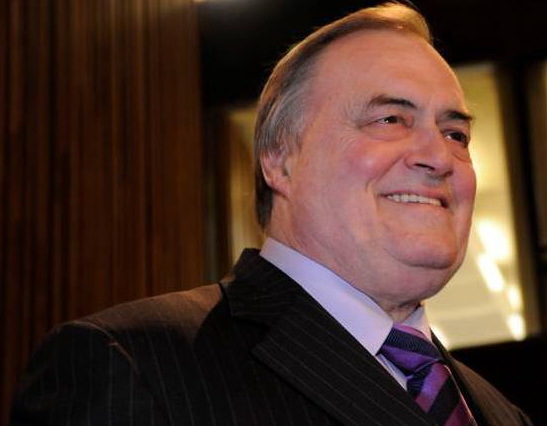 Lord Prescott is also the Leader of the British Delegation for the Council of Europe a body that has 47 member countries representing over 800 million people and also has special responsibilities for representing the Council of Europe on in both relationships with China and Climate Change. 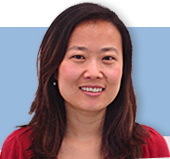 Katherine leads the Greater China Liaison and Advisory Services team for BDO International. Based in the UK, her role includes overall coordination across the streams, sectors and regions with the firm's activities in relation to China and BDO firms in China. 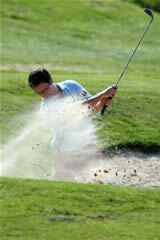 The team covers client service issues, business development and project delivery support. Further to this, Katherine also develops and delivers commercial and strategic advisory services to clients with a China or UK interest, along with colleagues in audit, corporate finance and tax services. Externally Katherine leads and supports the partners and sectors in developing China related relationships and BD network in the UK and China. Katherine has BA, MSC and MPhil Degrees in business studies, and has had professional training in management consulting, marketing, and business administration. Prior to coming to the UK, she worked in China and parts of South East Asia for 5 years.